It's finally here: the comics event so massive that it built over the first half of 2005, through COUNTDOWN, DAY OF VENGEANCE, RANN/THANAGAR WAR, VILLAINS UNITED and THE OMAC PROJECT! 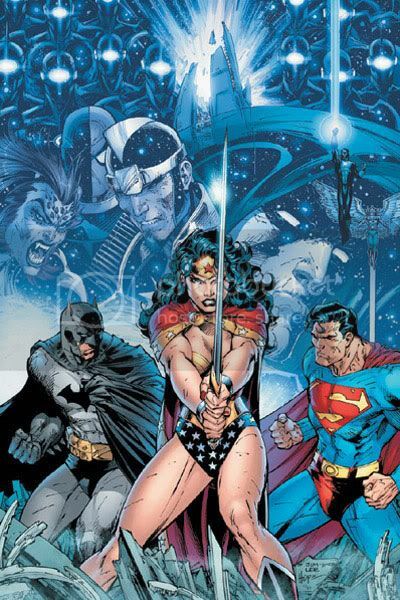 Prepare for the dawn of the DCU's darkest day in INFINITE CRISIS, a 7-issue miniseries written by Geoff Johns (GREEN LANTERN, JSA) with art by Phil Jimenez (OTHERWORLD, Uncanny X-Men) & Andy Lanning (OTHERWORLD) and covers by George Pérez (CRISIS ON INFINITE EARTHS) and Jim Lee (BATMAN, SUPERMAN) & Sandra hope! Surrounded by their most fearsome enemies, the world's greatest heroes are divided within and without. DC's icons — Superman, Batman, Wonder Woman — are joined by Nightwing, Supergirl, Donna Troy, Superboy, Robin, Wonder Girl, Green Lantern, the Flash and more as they face their most dire hour. What happens next will destroy friendships and lives, dictating the direction of the universe for the next generation! Years in the making, the greatest event to hit the DCU in over two decades is about to explode — don't miss out!